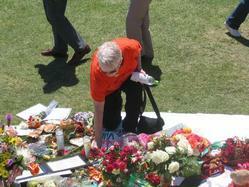 After April 16, a lot of people came drillfield to mourn for the victims every day. People bring flowers and balloons to the drillfield, in order to mourning for the victims. Pictures of the victims in April 16 were posted in the Squire Student Center. People came to the Squire Student Center with flowers and balloons to mourn for the victims on April 19. 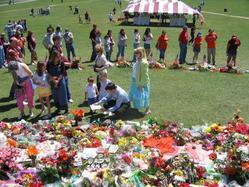 One week after the shooting,people set six flags on the lawn of the drillfield to mourn the victims. 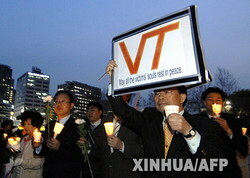 In Seoul, Koreans mourned for the victims in the shooting. "May all the victims&#39; souls rest in peace". the August 19, 2007 memorial dedication ceremony.